Starting with the first hint of spring, I believe it safe to say. Many of us have thoughts of not only baseball and the like. Thoughts of Camping, fishing trips, backyard barbecues and getting our gardens planted have been the object of many a daydream. As we think about all the opportunities, we have for outdoor cooking. 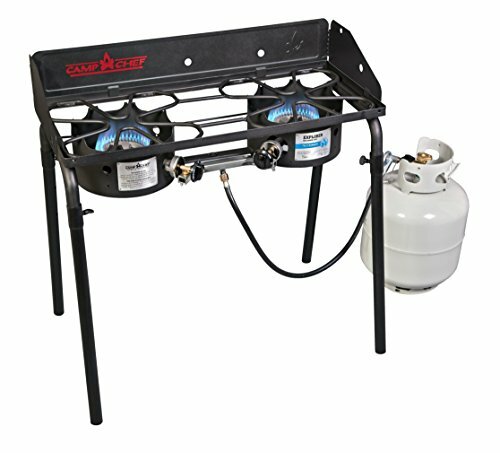 All the things we could do if we only had a good two-burner LP gas outdoor cooking system. Now before we could ever justify spending any money on a new cooking gadget like this. It would need to be portable, easy to set-up and use. After all, we have a chili cook off, fish fry, and all the family backyard barbecue parties to think about. Shoot, giving it a bit more thought, we could easily use a two-burner gas cooker to can all our favorite foods, making it much easier to keep the canning smells, mess, and excessive heat out of the house. Much to the chagrin of my supportive wife and kiddos, putting up with many painstaking hours spent going from one store to another researching every model gas cooker we could find. We came to one unanimous conclusion, the Camp Chef explorer series EX-60L 2-burner modular cooking system is the best gas cooker we found anywhere, best of all, at a reasonable price. What makes the Camp Chef explorer the best portable gas cooker? 1. Easy to set-up and use, the four independent sturdy steel legs, made of heavy-duty tubular steel, support the camp chef LP cooker, a large stockpot, hot water bath canner or even both at the same time. This easy to adjust leg set-up makes it quite easy to slip each leg into their counterparts. The larger diameter steel tubing welded inside each of the four corners of the frame and burner assembly. 2. 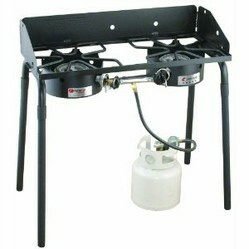 The heart and soul of the Camp Chef gas cooker is its 2-30,000 Btu burners’. Independently controlled by using a set of control knobs to adjust the burners just like those found on your typical gas cook stove or LP range. Makes it easy to simmer a pot of coffee, or BBQ sauce on one burner, and boil a large pot of water for a batch of corn on the cob, all while keeping an eye on the grill, or other goings on. 3. Measuring, 16 1/4 Inches from front to back, and 34 Inches from the left side of the cooker to the right side, by 9 1/2 Inches thick the Camp Chef explorer series 2-burner cooking system weighs in at a lean 35 Lbs., less the LP tank, pots or pans.;). Legs removed and stored in the handy carry case the cooker is easily stored on a shelf in the garage, or taken along on your next camping, fishing or other outdoor adventure. 1. The basic set up consists of two LP fired 30,000 Btu gas burners, protected by a windscreen on three sides, right, left and back. This helps to keep the heat from blowing away on a gentle breeze. 2. 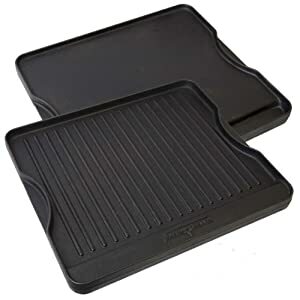 The optional Camp Chef SG60 deluxe steel fry griddle measures a generous 32-inches wide, and 15-inches from front to back. This pre-seasoned steel grill covers all but an inch or so on the two-burner cooking area. Works great when frying bacon, pancakes, grilled cheese sandwiches or anything else you would want to fry on the grill / griddle. 4. Ok, I understand, weight is sometimes an issue for many of us no worries. 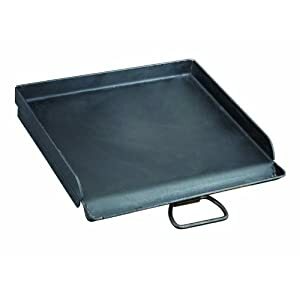 With the Camp Chef SG30, deluxe steel fry griddle frying eggs, potatoes, or pancakes is much easier than dragging out the ole skillet. Measuring 15-inches by 16-inches this steel grill / griddle only covers one burner leaving the second free for brewing coffee, boiling water or whatever you need. 5. Turn your two-burner gas cooker into a BBQ grill with the BB60L deluxe sport grill box. 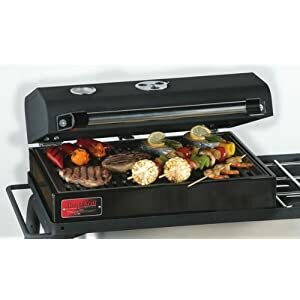 This handy grilling accessory covers one burner and comes complete with cast iron grill grate, hinged hood with thermometer and diffuser plate that vaporizes the fats and grease infusing foods with the Smokey goodness. I think it safe to say we all like to grill a few burgers, dogs, chicken and steaks while in the great outdoors. One thing is for sure, planning for a season full of our favorite outdoor cooking, family or company cookout, backyard barbecue, a weekend fish fry or canning our favorite fresh foods. Having a two burner outdoor cooker will surely make cooking outdoors easier. 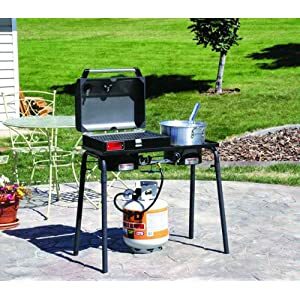 In this review of the best portable two-burner LP Gas outdoor cooking system, I believe we will all agree the research is complete. All we need do now is simply buying the Camp Chef explorer series EX-60L 2-burner modular cooking system and enjoy cooking in the great outdoors. 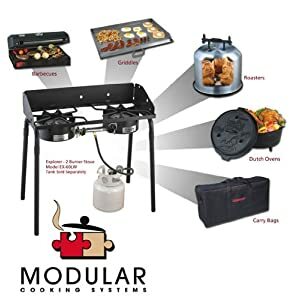 One last thing, the only place I found all the cool accessories for the Camp Chef cooker was online at amazon, and with the free super saver shipping option, amazon has the best pricing. Thanks for taking time out of your busy day to read this review, if you are so incline. Please leave a comment and let me know what you think. March 30, 2013 - It's time to haul out the grilling apron (with the silly saying on it), long handled tongs and spatula, the brass brush and fire up the grill. @Jerrico Usher thanks for the suggestion, just testing. @SusanZutautas ah yes outdoor cooking on the barbecue grill is one of my famlies favorit things to do when the weather premits. Our boy scout troop uses a Camp Chef exploere series cooking system to boild water, coffee, and anything else the scouts care to cook. Granted, the cast iron dutch oven and a bit of charcoal works well for the mountain man breakfast thing, a two burner gas cooker is the best way to boil water, simmer bbq sause, or canning foods at garden harvest time. I may have to buy a new gas grill this year, and I like what the camp chef has to offer. Great review!